The first time I flew with a baby was when my son was five-months old, and the trip was just he and I. I was so nervous about the flight; all I heard from other people was that I was crazy to be flying with a baby – and I was flying ALONE with a baby – and I was flying alone with a baby to another continent! I made a crazy amount of lists and schedules and packed so much stuff into our carry-on bags that I looked like a pack mule walking through the airport. I thought I was completely prepared, and it wasn’t until I actually got to the airport and started the trip that I realized I’d been researching all the wrong things, and missed some pretty important things off my to-do list. 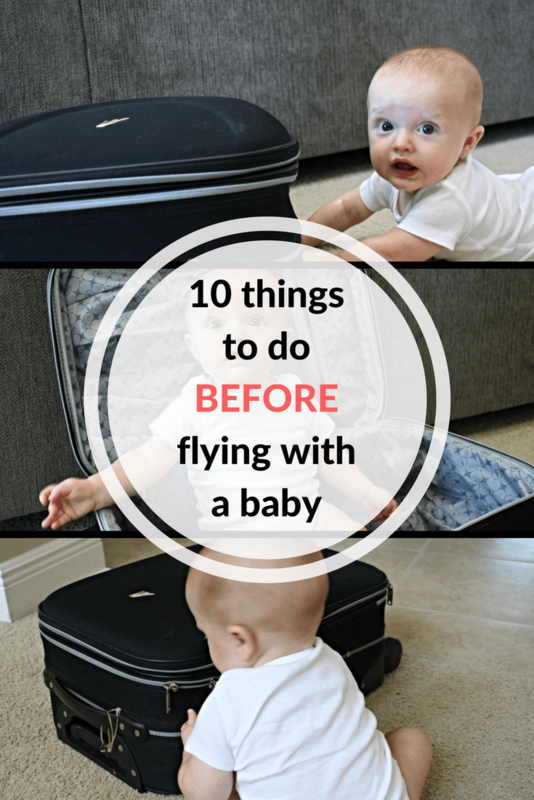 So here is my list of 10 things you need to to BEFORE flying with a baby! This is the most important thing to do – and the one thing I didn’t do AT ALL when I flew with a baby for the first time! Before you even book your ticket, look to see what your airlines policies are regarding travel with an infant. If you plan to travel with a lap baby (read more on flying with a lap baby here), double check to see if you need to pay for the baby, or if they will be free. We were upgraded to first class the day before our flight on that first trip, and when I got to the airport, I found out that traveling with a lap baby in first class internationally meant I had to pay for him, even though the upgrade was free! That was an unpleasant – and expensive! – surprise that could have been avoided if I’d just called the airline when the upgrade was processed. Also take a look to see if you can check a stroller and a car seat for free, as well as checking your luggage allowance to see if you can take a diaper bag on board with you as well as your normal carry-on bag. The majority of this information should be available on the airlines website, but if you have a question you can’t find an answer to, just call the customer service number and ask. If at all possible, try to avoid connections when flying with a baby. The thought of a 10-hour direct flight to Hawaii with a 12-week old baby was horrifying to me, but it was a whole lot less horrifying than a connection somewhere (which is what we had to do on the way home). Nothing adds stress to a trip like a delay on the first flight, worrying about making your connection, running through the airport like a loon with all of baby’s stuff – I’m anxious just writing about it! Once you’re on a plane, no matter how long the flight, you can get settle in knowing that you don’t have to move around too much until you reach your destination. If the best of the best happens and baby falls asleep, you can stay in one place without thinking about waking him or her up to get off one plane and on another – the last thing you want to do on an airplane is wake a sleeping baby! If you do get delayed, read more on flight delays with kids here. When you actually book your trip, give some thought to what time you will fly. Pre-kids, we would always try to take the very first flight of the day to get to our destination as soon as possible. Now, I try to plan my flights around the kids nap time, or when they’re least likely to be grumpy – this generally means we fly mid-morning or mid-afternoon, and try to avoid super early or late night flights when the kids will be overtired. This generally leads to less meltdowns, both from the kids and from us! If we’re flying long haul, we try to pick overnight flights since there’s a greater chance that baby might sleep, and we can all get to our destination somewhat refreshed. For more on red eye flights with a baby read this post. I hate it when airlines start charging for things that were previously free (paying for checked bags, anyone?) and paying to reserve a seat is one of those things. Some airlines will still let you choose your seat for free, some will only charge for a premium seat, and some charge for any seat. I think this is an area where it’s absolutely worth spending the money; I can attest that sitting in a middle seat between complete strangers with a lap baby is not fun, as we were stuck in that exact situation when a flight was cancelled and we had to fly stand-by. If you are traveling with a baby or a child, you will not be able to sit in an exit row, but you can give some thought to where else you would like to sit. A window seat can be a good idea so a slightly older baby can look out of the window – this still fascinates my son to this day! On the other hand, an aisle seat means you have more flexibility to get up and walk around if baby gets fussy. If you fly with an airline like Southwest who doesn’t allow any form of seat reservations, it’s worth looking to see if you can spend the money to check in online earlier to get an early boarding group. Seat Guru is one of my favorite resources for finding the best seats – you can type in your flight number and find out what plane you’ll be on and where the best place to sit is! Most people are aware that babies under two can fly as a lap baby for free. This is great as it saves money, sometimes hundreds or even thousands of dollars. But only you can decide if you want to travel that way, or if you would prefer to buy baby a seat and take a car seat (read about travel with car seats here). We have done both in the past. The FAA does recommend that all babies are secured in a car seat for their own safety – you can check out what else they have to say about flying with a baby here. If you decide to purchase a seat for your baby, there are a few things to keep in mind. Tickets for children are often cheaper than tickets for adults; if you don’t see this as an option when booking online, look for an advanced search or call the airline directly to inquire. You will also need an FAA-approved car seat. The majority of car seats are approved for taking on board a plane; look for a sticker on the side that will tell you if your car seat is suitable. Read through this post on the best portable car seat for travel. Even if you’ve flown from your home airport a bunch of times, an airport is a totally different place when traveling with a baby! Find the website for your airport and have a look at a map of the terminal; see if you can find out ahead of time which gates your airline typically uses, and then look for important places in the surrounding area, such as family restrooms, lactation rooms if they are provided (most airports don’t have these, so you’re super lucky if your airport does! ), somewhere you can run and grab some bottled water, etc. If you are flying alone with a baby, you can call the airport beforehand and inquire about a guest security pass, so that a friend or family member can come through security to the gate with you, even if they are not flying. If you’re really anxious, take a trip to the airport before your flight to walk around. You obviously won’t be able to go through security, but you can get an idea of the layout ahead of time. If you’re flying with a toddler, check out my Airport Scavenger Hunt to keep them occupied. When packing for your trip, give some thought as to what you might need, and when you might need it. Think about how you’re going to get through the airport; will you have a stroller, will you carry your baby in a carrier, are you planning on bringing a backpack or a rolling carry-on? I find it easiest to wear my baby in a carrier, and have a diaper bag that is either a backpack or has a secure shoulder strap. This way I have my hands free, which is really helpful when going through security. You can also go through the scanner at security without having to take the baby out of a carrier, whereas baby will have to come out of a stroller, and the stroller will have to be folded up and put on the conveyor belt – not an easy task! Make sure your diaper bag has everything you will need, and nothing that you don’t – you’ll want the bag to be as light as possible. Take a look at my complete diaper bag check list for plane travel to make the trip super easy and 15 Dollar Store items for plane travel here. When I was planning baby’s first trip, none of my friends had flown with their babies and as I said earlier, they all thought I was nuts. There was very little by the way of useful information, and I just decided I’d have to figure it out on my own. Since then I’ve discovered some fantastic travel resources, such as blogs (like this one!) where moms give you tried-and-tested advice on what to expect for your flight. Pinterest is a great tool for finding things like that – check out my Pinterest account here for links to some of the helpful sites I’ve found. You don’t need to take every piece of advice offered, and don’t drive yourself crazy over-researching. But if you see the same advice offered over and over, it might be worth taking note and incorporating that advice into your trip planning. Almost every airline will offer some form of pre-boarding with a baby or infant. Give some thought as to whether or not this is something you really want to take advantage of though. If you are traveling with another person, send them on during the pre-board process to get set up; secure a car seat, put the overhead bag away in a convenient location, choose seats if you haven’t already done so, etc. Then you stay walking around with the baby until the other passengers have boarded (just don’t walk too far – you don’t want the gate to close without you!) This way you’re not sat with a squrimy baby waiting for everyone else to get on. If you’re traveling alone, it might be best to board first just so that you can make sure your carry-on bag gets space in the overhead bin. I had a nightmare flight when I boarded later, only to find there was nowhere for my diaper bag to go, and it was going to have to be checked! Thankfully it was a short flight and I was able to grab a couple of necessary items out before the bag was whisked away, but I was so stressed during the flight knowing I had none of the things I had so carefully packed! So when you’re thinking about when you’ll board, keep all of this in mind. Yet another thing I didn’t do on that first trip! When departing Orlando, I’d arranged for my husband to come to the airport with me and had a guest pass for him so he could literally come right to the gate with me. I also had my parents meeting me at the other end in England – but they would be on the other side of Customs and more importantly, I would have to pick up my checked bags before I reached them. This literally occurred to me as I was stood in front of the baggage carousel! I had my son in a baby carrier, my diaper bag slung over my shoulder – and two full sized suitcases plus a stroller and a car seat in a pile in front of me with no plan as how to get them out to where my parents were waiting! I must have looked particularly helpless because a kind-hearted couple stopped to ask if I needed help, and the gentleman kindly took my two bags while I huffed and puffed behind him with the stroller and the car seat. If they hadn’t approached me, I might still be stood there. Some airports have the baggage carousels on the other side of security so if someone is meeting you, ask if they can park their car and come in to help you out, rather than meeting you curbside. If you’re flying internationally, chances are that you’ll have to collect your bag before security. It’s worth doing some research to find out what help you can get with your bags (find out if the airport has baggage carts and if you’ll need to pay for those with coins, or if the airport has a service you can reserve to meet you at the gate to help you) and if all else fails, don’t be afraid to ask for help! What are you top tips for preparing to fly with a baby? Tell me in the comments below! I find your blogs so very helpful. Please continue what you are doing. We will be going to Disney World next fall and I am concerned about the packing situation. What is the best way to pack for a 10month old, myself, and my husband? I would love it if we could use one large suitcase and just our carry ons but Im not sure if this will work. Thoughts? So when we only had one little one, we absolutely used just one big suitcase for the three of us! I used to put the baby clothes into individual Zip-loc bags and label each one for whatever day he was going to wear it. Have you ever used packing cubes? That’s what we use to separate our clothes, so it’s not just one big mess of stuff in the case. These are the ones we have: https://amzn.to/2sZJt3A Going to Florida in the fall you shouldn’t need too many heavy clothes, so you shouldn’t have any trouble with things fitting (although if anyone has to sacrifice space, it’s usually my husband!) I would definitely put essentials like diapers and wipes into your carry on, and put a couple of changes of clothes in there for each of you (even if it’s just a clean t-shirt) just in case anything happens with you case. Remember, you get to bring a diaper bag as well when you travel with a baby, so you could have quite a bit of carry on space. Hope that helps, and let me know if you have any other questions.